Obsolete and discontinued replacement toilets by Trent Bathrooms, Armitage Shanks, Ideal Standard, Qualitas, Doulton, Twyford and Spring to name but a few. A close-coupled toilet suite has a cistern bolted directly to the pan. The pan usually projects into the room further because inside are two chambers, known as traps, instead of only one in the close-coupled. To allow the second chamber to flush properly, an air extractor, or bomb, is placed inside the syphon of the cistern. This is made of either plastic, or in rare instances, copper. A back-to-wall pan is nearly always used with built-in furniture. The back of the pan is square, to allow it to be sealed directly onto the wall. A wall-hung pan is the same as a back-to-wall pan except that it does not touch the floor. A low-level toilet suite comprises of a pan and cistern separated by a water pipe. A low-level syphonic suite is similar to the low-level suite. The only difference is the pan back entrance, or trap is virtually on the floor. 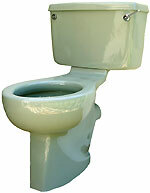 We hold stock of various colours and models of toilet seat, including unusual designs from Ideal Standard and Twyfords. 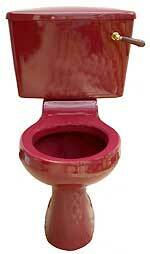 We have large stocks of cistern lids from many different manufacturers in a vast array of colours.